Here is another blossom that I first made three summers ago. I think that I was the first to make it, but I won’t say I ‘invented’ it, since using that word to describe making drinks has always seemed a bit pretentious to me. I don’t believe anyone else is making this drink. It is surprisingly good, and I used to call it the Savory Gin Surprise. 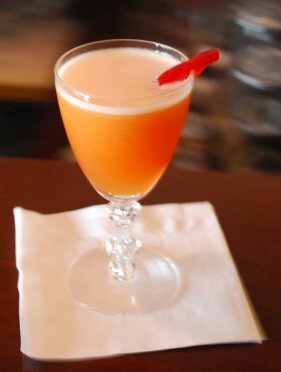 But, it is basically a blossom based on gin and ‘blossomed’ by fresh bell pepper juice and accented with a little Serrano pepper. The name Gin Pepper Blossom, or just Pepper Blossom, seems more appropriate to me now. Depending on the size and succulency of the peppers available, it should take two or three whole peppers to make this drink. This means that it is a little more expensive to make than most drinks, but I believe it is worth it. Once you have your peppers appropriately cut, place them into a metal mixing tumbler. At this point, I like to add one or two ⅛ inch slices of Serrano pepper. Use a muddler to smash as much juice as you can from the peppers. An electric juicer could probably be used, also. Strain the juice out of the metal mixing tumbler into another vessel and reserve for making the drink with. Chill a 5 ½ fl-oz. glass goblet. Into a clean glass or metal mixing tumbler, pour a jigger (2 fl-oz. by pre-prohibition standards) of gin. Old tom gin is nice for this drink. If you prefer to use a dry gin, an especially floral one should be considered – along with an optional teaspoon of superfine sugar, or ¼ fl-oz. of 1:1 sugar syrup. I sometimes add a pinch of sea salt, too. Now add a pony (1 fl-oz. by pre-prohibition standards) of the previously prepared pepper juice. If you have used ice to chill the goblet, empty it now and shake off the excess moisture. Now add plenty of method ice to the other ingredients in the mixing tumbler. Cover it and shake vigorously. After about fifteen seconds of shaking, the drink will be as cold as it will get, but shaking even longer is encouraged to further aerate the drink, which opens up the flavors even more. Using both a Hawthorne strainer and a fine strainer, strain the drink into the goblet. Garnish the drink with the strip of pepper reserved from above. Enjoy your Gin Pepper Blossom!